"I was working with a real expert/professional"
...Had an air quality test done - Adam answered all of my (admittedly paranoid) questions, consulted with an outside expert to come up with a testing plan, explained exactly how he would conduct the test, showed up on time, and offered an affordable price. 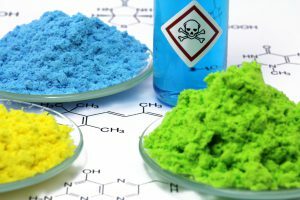 ...this company came to my rescue at a price I could afford and delivered a written report of the highest quality documenting the mold problem in my home. Their quality of work and report exceeded all my expectations. Thank you Carity IAQ Solutions! 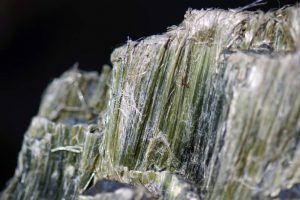 But I Thought Asbestos Was Banned? Conjunctival irritation, nose and throat discomfort, headache, allergic skin reaction, dyspnea, declines in serum cholinesterase levels, nausea, vomiting, nose bleeding, fatigue, or dizziness. Concentrations > 0.05 ppm can cause irritation of the eyes, nose, throat and sinuses. Resulting symptoms include burning, dryness, redness and itching of eyes, nasal dryness, soreness, runniness; sore/dry throat, and sinus congestion or post-nasal drip. Get answers now about Mold Testing, Mold Inspection, Asbestos Sampling, VOC Testing and more. From mold inspections to VOC assessments, we’ve helped many in the Phoenix Metro area pinpoint the exact problem within their indoor environment that was causing them concern, discomfort, and/or sickness. No concern or situation is beyond our care or reach of expertise. We look forward to the opportunity of helping you with your inspection, sampling, or consulting needs. 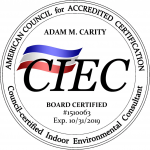 The CIEC program is dual-accredited by the National Commission for Certifying Agencies (NCCA) and the Council for Engineering and Scientific Specialty Boards (CESB) and requires a minimum of 8 years of documented experience consulting on indoor environmental issues including asbestos, lead, HVAC, building science, chemicals, mold and microbial contamination. Qualified applicants too must pass a rigorous exam before being accepted by a board of industry peers. But that’s not all. To maintain the CIEC designation, a specific amount of continuing education credits are mandatory. Our goal is to provide each client with accurate information, defensible lab data and reports, and prescribe effective solutions for any given indoor environmental issue or concern. Indoor air quality is ranked as a top 5 heath risk by the United States Environmental Protection Agency. What’s more is the average individual spends about 90% of their time indoors and inhales approximately 3000 gallons of air per day. With just those 3 staggering statistics, it’s no surprise that indoor air quality is a concern for many. We’re experts at investigating occupant and worker complaints and concerns relative to their indoor environment. Our investigations cover any type of structure. Furthermore, we have all the latest equipment to provide the most thorough inspection or sampling in the industry. Our Indoor Air Quality and other Inspection, Sampling, and Consulting Services extend to Casa Grande, Maricopa, Buckeye, Gold Canyon, Anthem, Peoria, Tempe, Parts of Pinal County, Glendale, Avondale, Phoenix, Carefree, Cave Creek, Scottsdale, Paradise Valley, Chandler, Gilbert, Queen Creek, San Tan Valley, Apache Junction, Mesa, Fountain Hills, Tucson and Parts of Coconino County. © Copyright 2016-Present by Carity IAQ Solutions LLC. All Rights Reserved.